Very helpful thoroughly written interesting content. Poems are written the best when they are short, but have a deeper meaning. I never knew poems can be used in this type of way, very interesting. The pictures were helpful in giving a visual and the content was easily understandable and broken up. Thank you for this excellent review. Thanks for the visit and your comments. Please come again…. I agree with your final thoughts. These book are to help a person get started, giving a person food for thought, but they cannot do the work. The common denominator is the person. He has to take action. Not just one day but everyday. It takes a persistent effort to change. Thanks for the visit and the comments. Please come again…. I am one of those people who get all excited about reading the self help books, get ready to implement what needs to be done, and then it falls into the too hard basket to try and change those habits that have infiltrated my mind for 60 years!! I seriously need to change my thought process on being able to implement a least one idea from each book instead of being overwhelmed by thinking I have to try them all. Thanks for your visit and your comments. It is a truth. Trying to change everything all at once is the downfall of most attempts for self-change. It is just too, too much and every stumble makes all the other stuff you are trying to do at the same time wibble-wobble. And then you fall down…again. I agree no-one else can change you, it has to be from you. Recently I had a bad experience with someone who unfortunately is making her own life hard and she needs help. However, she won’t hear of it and professionals I’ve spoken to say that there’s nothing to do. She has to want the help and the change and until then nothing they do will help. 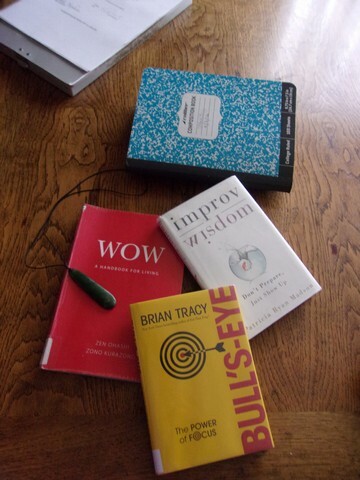 Great books, I would love to read WOW: A handbook for living. Sounds amazing! Thanks for your visit and for sharing your story. Please do come again. Thanks for your visit and for sharing your thoughts Salim. I’m glad you found the post interesting. Improv Wisdom definitely caught my eye in part because Patricia Ryan Madson’s views on life reflect my own. Unless I’m much mistaken, she’s stating moving on intuition is the way to go in life over trying to plan and perfect, which often leads to, well, uncertainty when a plan goes awry, at least in my experience. My own life’s experiences has consisted of planning, careful planning, which always lead to failure. In the world of writing books, we refer to these people as outliners, and perhaps it might work for some. But improvisation, if mastered, will work in any given situation; the ability to think on our feet and as we’re undergoing tasks will work in the end, kind of like living life by the seat of our pants, life on the edge. That’s my kind of life. Good for you, Todd! I agree. Improv is a heck more fun than pencilling out all of your moves ahead of time. Mostly, all that pencil-work means is getting blind-sided by the stuff you just don’t know about or really can’t see. Thanks for the visit and for adding your own thoughts. Please do come again. This is a mind blowing article. The message is well constructed and really is well passed across to the readers. I love poems and they are filled with inspiring and motivating quotes and messages. I agree with you that taking action everyday and not just once is the right thing to do. This article has blessed me and inspired me more. Brent, thanks for your visit and for sharing your thoughts. I’m pleased that the post was helpful to you. Thanks for writing out this lovely article and I must say its a must for everyone to read and digest. Books are our best friend in loneliness, and inspirational books are really working the way it’s written. But making use of these words are what brings result to our expectations. Your post is lovely and amazing, I would love to get a book by Brian Tracy through your link. Thanks for the insightful article. Thanks for the visit and for sharing your thoughts, Whitedove1. I do appreciate it. So much fuss about motivational books that work on ones’ psychology. Change indeed is an inside job. I have listened numerous times to Brian Tracy audio and I have some of his books. He indeed is a change agent. Motivational or inspirational books can help change a person mindset. one’s mindset matters a lot in life. It is possible for someone because of a past bitter experience to write himself off and find it difficult believing he can ever succeed. Motivational materials help if the person would implement the lessons. Tolu, thank you for the visit and for sharing your thoughts. You’re right, I think. Motivational and inspirational books are doorways to discovering different attitudes and ways of walking. There are so many different choices. Any of them can work…if a person actually busts out a recommended move and keeps on doing that over and over again. Wao, this is excellently educative. Thanks so much for this wonderful presentation of a deep thought. I humbly agree with your final thoughts. This book is to help a person get started, giving a person food for thought, but it cannot do the work. The person has to take action. Not just one day but everyday. It takes a persistent effort to change. However, collecting insight is a wonderful hobby. And if you are close to a decent public library and you don’t go in to attend good conferences and get-togthers of like minded beings. It is even cheap. Best wishes! Thanks for the visit and for taking the time to comment, Sajua24. I am glad you enjoyed the post. I think your article is a complimentary article. I read your article and realized that there is a change in the lives of every person and it can be read books. And you told about the different writers in your article, those who gave different inspirational messages to their books. It is really awesome for us. So, thank you for sharing your article . Thanks for the visit, mohammadahm1. I am pleased you enjoyed the post.